It’s very hot in Montreal so when the #FoodieMonday #Bloghop group decided on Monsoon Madness, as our 47th theme, I must admit I was in a dilemma. What do I make that’s apt for the Monsoon season without frying pakodas! For me monsoon season in Bangalore meant hot kheer or raab and dal vadas. I love the hot spicy vadas that are sold in the market areas around Bangalore. Monsoon also reminds me of the hot roasted corn(bhutta) in Mumbai near my sister- in -law’s apartment and Juhu beach. Roasted corn with lemon and red chilli powder is so delicious. A couple of days ago we had bought some fresh corn to boil and have with some butter or lime. The corn was really sweet and tender. That’s when the idea struck…. why not make makai no chevdo which is a typically Gujarati snack, very tasty and easy to make.It’s a perfect monsoon treat. I remember my kaki would make this for us during the corn or maize season in Nairobi. Its best to get the nice tender corn and not the hard ones for this preparation. Summer time in Montreal means that people are making trips far and near to connect with Nature. Hiking, swimming,gardening, boating, trekking, camping, climbing or outdoor sports. Its very difficult to find people not doing some sort of activity. Canada is blessed with wonderful National Parks, with rivers, lakes, mountains and forests. A few days ago we went to Mont Tremblant with our son. Tremblant village at the base of the Mont Tremblant is a quaint little place. People can walk the cobbled pathways without cars, buses and motor bikes obstructing their way. On either side of the streets are eateries and shops. Canadians respect pedestrians unlike in India and Kenya. Coming back to today’s recipe, it is very simple to make. Why its called chevdo I have no idea! Hubby calls it makai ni khichdi. I enjoy this preparation as a snack or as a light meal. Make it hot to ward off the cold by adding more chillis. I’ve added chopped cashew nuts to add extra flavour and bite. Tremblant village. Cobbled walk paths. Wash the corn and with a sharp knife slice off the corn kernels from the cob. Some people prefer to grate it but I don’t like the mess so I prefer to cut the kernels off the cob. Put the corn in a food processor and process to a coarse paste. You should have about 2 cups of this coarse paste. Heat oil in a saucepan or wide pan over medium heat. When it is hot add mustard and cumin seeds. Add asafoetida, cashew nuts, chopped chillis and ginger paste. Mix and add the corn. Add salt, turmeric powder and milk. Cover the pan and let the corn cook in the milk for 5-7 minutes or till the mixture becomes semi dry. Take the pan off the heat. Add chopped coriander and lime juice. Mix well and serve immediately. Add sugar only if the corn is not sweet. You can use white or yellow tender corn. You can use frozen corn kernels. I love adding a few raisins to the chevdo. If you like a tangy taste, add a bit more lemon or lime juice. 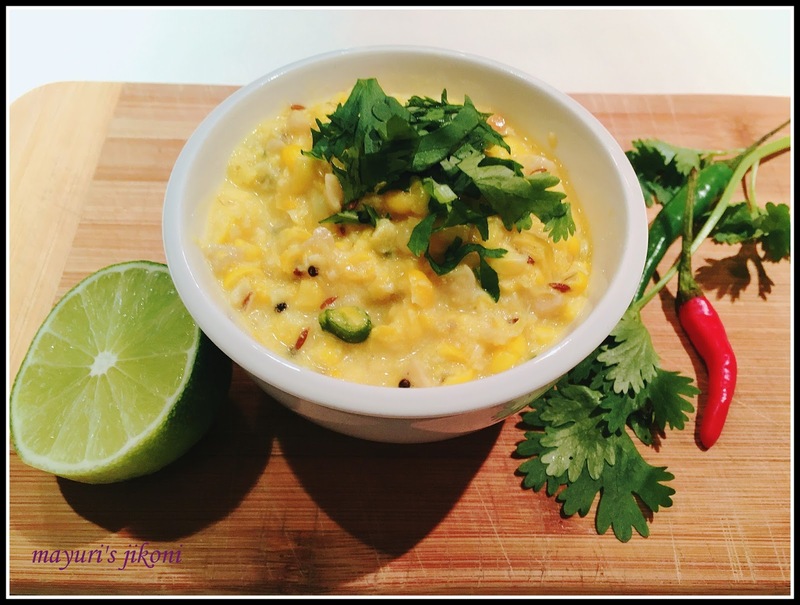 A healthy and flavourful Makai no Chevdo recipe share Di. Beautiful pictures of Montreal. Looks so flavorful dish..love the ingredients used in Makai no Chevdo, healthy share & beautiful pics of Montreal. You always comes up with innovative and useful share Mayuri….and thanks for the beautiful pics of Montreal. Wow loved the Montreal pics and the makai no chevdo too.very different for me and healthy too.